Why bone grafting with dental implants ? For dental implants to be successful, the jawbone must have enough bone to support them. Loss of teeth often leads to more loss of bone. The tooth loss may be caused by periodontal (gum) disease, dental caries (cavities) and infection, injury or trauma, or a developmental defect. If the bone under your gum is not tall enough, not wide enough or both, you will need a procedure to add bone to your jaw before implants can be placed. 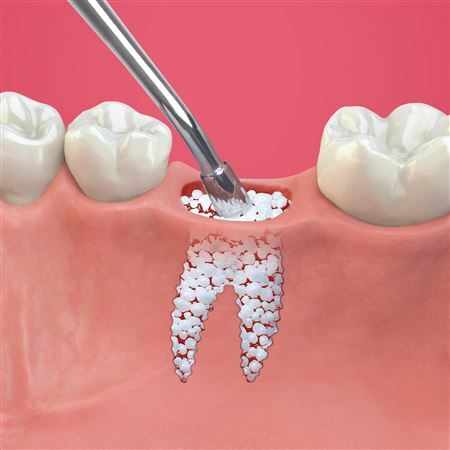 Bone grafting is done to reverse the bone loss caused by periodontal disease, trauma, or ill fitting removable dentures. It is also used to augment bone to permit implant placement, such as augmenting bone in the sinus area for implant placement, or augmenting bone to enhance the fit and comfort of removable prostheses, or to enhance esthetics of a missing tooth site in the smile zone. When one loses a tooth, as in an extraction, the surrounding bone collapses. To preserve this bone for future implant placement or for esthetics, a bone graft is used. 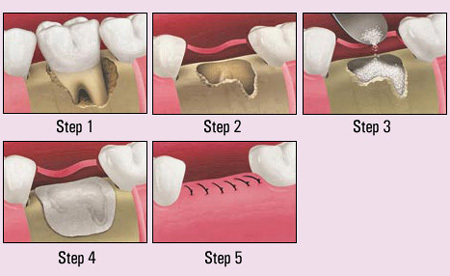 How is bone grafting done ? teeth implantThese procedures typically involve grafting (adding) bone or bonelike materials to the jaw. The graft can be your own bone or be processed bone. After grafting, the patient may need to wait for few months for the grafted material to fuse with the existing bone. “Off–the-shelf” grafted materials either cause surrounding bone to grow into the graft or cause cells around the graft to change into bone. A graft from your own bone transplants bone cells or a block of bone that fuses to the jaw. After bone augmentation, dentists usually wait four to nine months before placing implants. Where Does the Bone Come From ? This most likely will come from the adjacent area where implant is being placed or from your chin or ramus (the back part of your lower jaw). If your dentist cannot get enough bone from these areas, he or she may need to get bone from your hip or shin bone (tibia) instead. If you don’t like the idea of having bone removed from your body to be placed in your jaw, other excellent option which is commonly used is synthetic bone graft material. These bone graft substitutes do not require a second surgical site as does the autogenous bone moreover ample amounts can be easily obtained. The success rate for bone grafts in the jaws for the purpose of placing dental implants is very high. However, there is always a chance that the bone graft will fail, even if your own bone was used. Bone grafts are not rejected like organ transplants. In conjunction with bone grafting, membranes are often used to help stabilize the bone graft as well as displace the gum tissue from invading the healing bone graft. Gum tissue grows at a much faster rate than bone, therefore, membranes are used to prevent gum tissue from growing in and displacing the bone graft before it matures. In addition to bone grafting, many other types of procedures can be used to build bone for placement of implants. Sinus lift (or elevation) – It increases the height of your upper jaw by filling part of your maxillary sinus with bone. 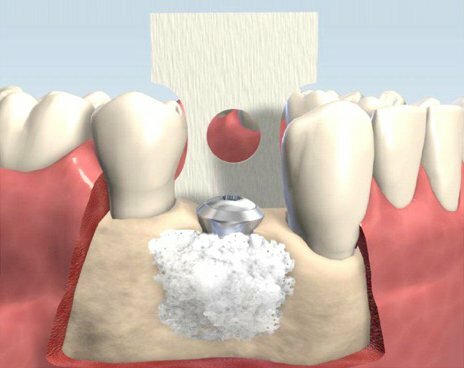 Ridge expansion – is a type of bone graft that can be done when the jaw is not wide enough to support implants. A special saw is used to split the jaw along the top (ridge) and packs graft material into the newly created space. Distraction osteogenesis – It is used most often to increase the height of bone that is too short. This procedure originally was used for lengthening the bones of people with abnormally short legs. It now has been adapted for use in the mouth. Nerve Repositioning – A nerve called the inferior alveolar nerve runs through the lower jaw. This nerve gives feeling to the lower lip and chin. In patients who have lost significant amounts of lower jawbone, it may not be possible to place implants without damaging this nerve. To address this problem, an oral surgeon can drill a small window in the bone and move the nerve to one side. The implants then can be placed through the bony canal previously filled by the nerve. This technique is not used very often because it is possible to damage the nerve just by moving it.